We Create Music. We Know Production. As one of Nashville’s premier indie labels and production companies, we concentrate on Artist Development. And it all starts with a great sounding record, produced in some of the best state-of-the-art studios in Music City. Working with award-winning producer Dave Moody and our production team, we’ll produce the highest quality master of your music that will compete in today’s ever-changing world of music. Click to watch our PDF presentation of Recording in Nashville. With all our production services, we use the very best recording facilities available in Music City to track and record. We have great working relationships with Sound Emporium, Omni Studios, Sony Tree Studios, and others – where hits by Sheryl Crow, Blake Shelton, Miranda Lambert, Jewel, Kasey Musgraves, Old Crow Medicine Show, Little Big Town, Kenny Chesney, The Band Perry, Keith Urban, Taylor Swift, and many others have all been recorded. We rely on the exceptional talent of the same major label Nashville union studio musicians and award winning engineers that consistently work on the biggest hits and Billboard® #1s you hear on radio and television everyday. Need a producer? Want more info about our production services. Email Dave directly. Or fill out our New Artist Online Submission Form. 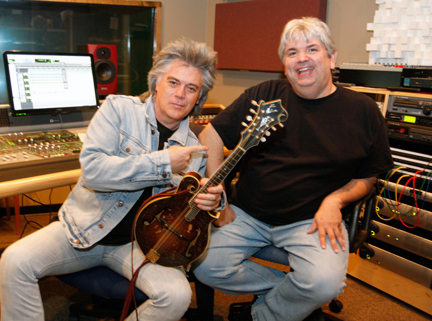 Marty Stuart and Dave Moody in the Studio. HD with the latest vocal tuning and processing plugins, vintage and new classic gear from API, Smart Research, Focusrite, Neve, Universal Audio, and much more. Dave Moody’s production and engineering experience makes him one of the most knowledgeable and skilled recording professionals today, as evidenced by the awards and accolades he has won from his peers in recent years! He’s an Officer of the Nashville Musicians Union (AFM Local 257) where he serves as a member of the Hearing Board. Josh Moody has over 12 years experience as a studio musician and engineer, and is often creatively involved in much of the production process as well. You’ll love the experience of recording with us! Rest assured by the awards we’ve won that your project will sound world-class. Our attention to detail and quality throughout the recording process will make the difference. Whether it’s a new album project by million selling artist Buddy Jewell, or this is your 50th album, as with our production of George Hamilton IVs last album with friends Pat Boone, Ricky Skaggs, Marty Stuart, and others… or it’s your first major recording session, as with Australiain newcomer Maxine Baker, pop-country songstress Caitie Andreen , Las Vegas sister sensation Jill and Julia, Christian artist SIXTH HOUR or Alt Rocker Joey Evans, you’ll be in good hands with our production team. Cr edits As a producer, engineer, musician and artist, Dave Moody †§ has worked with an impressive list of musicians and artists on television, in the studio, on recordings and in concert.